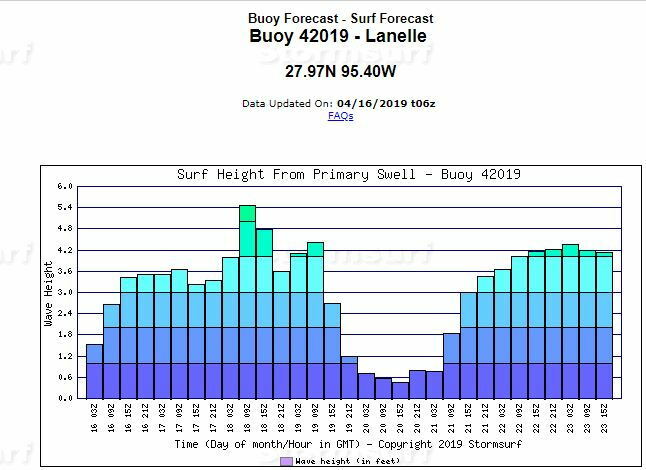 Count on 15 to 25 for wind and 3' @ 5 seconds...good beer drinking weather...running offshore not so much. Buoy weather says 0' at 8 sec til noon Sat. I'm thinking about going to Brazos reef A132 but I'm going out of Matagorda. Does anybody know what’s biting right now? Check windytv. NW at 17 knots 5 pm Friday switching due south Saturday to 13 knots by the afternoon is going to make for some really confused seas. Sword bite and deep dropping was really good a couple weeks ago. Lots of fish, but not much in season in closer. A Friday / Saturday weather window might be possible when the storm winds turn around. Could be a very Good Friday. I think it's a trap. I do plan to go out Freeport on Saturday, except we'll wind up deep dropping. I thought the same thing and was going to head out but after a little research, it doesn't seem like there will be anything really hitting.... it may be a little too early to head deep. Saturday looks awesome to me too... sure hate to waste a calm day like this but, then again, I'd hate to head out 60mi. and hit little to nothing. View Next Unread For the Panhandle Great White doubters.